Henrietta Elliot Peirce, sometimes called “Etta,” was born November 21, 1848, in Dayton, Ohio, the eldest daughter of Jeremiah H. Peirce (1818-1889) and Elizabeth H. Forrer (1827-1874). Henrietta was named after her paternal grandmother, whose maiden name was Henrietta Elliot. Henrietta received most of her education at home or through teachers of particular subjects. Like her sisters, Henrietta was artistic, winning an award at the Ohio State fair in 1866 for best pencil drawing. She also had a lifelong interest in gardening. As a young lady, she attended the commercial college to learn bookkeeping. On June 9, 1871, Henrietta Peirce married Henry Eugene Parrott at Five Oaks, her parents’ home in Dayton, Ohio. Henry Eugene Parrott, usually called “Eugene,” was born March 1, 1839, in Dayton, Ohio, the youngest surviving son of Thomas Parrott (1797-1864) and Sarah Sullivan (1880-1883). Eugene attended the Dayton Academy, Delaware College (later Ohio Wesleyan University), where he graduated in 1860 and later held the distinction of being its oldest living alumni. Father said to me this eve’g: “I wish you wouldn’t attend the war meeting ‘Gene, for I don’t want you to get into the notion of going to war. I am an old man and this suit (about the oil presses) troubles me a great deal & my private business, & I don’t want to have any more business to attend to. If the call is urgent Joseph [the middle son] will go & I think I ought to have one son at home to help me. Nevertheless, Eugene did participate in the war effort. On June 11, 1862, Eugene went on a steamboat from Cincinnati to retrieve sick and wounded soldiers from the Pittsburg Landing, Tennessee (Battle of Shiloh), remaining with the relief workers about two weeks. In September 1862, he was among the “Squirrel Hunters” who defended Cincinnati against the threat of attack from the Kirby Smith’s advancing forces. 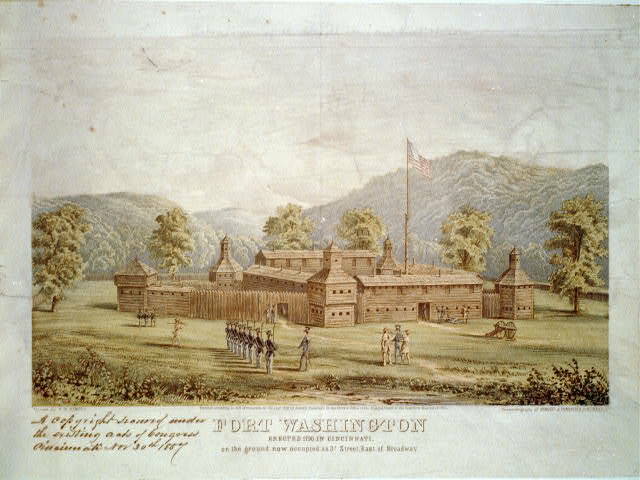 [For more on H. Eugene Parrott’s Civil War service in 1862, see “A Tale of Two Howards,” especially Part 7, here on my blog.] In July 1863, Eugene enlisted as an adjutant and lieutenant in the 86th Ohio Volunteer Infantry, which was commanded by his college comrade Col. William Lemert, and served six months, being mustered out in February 1864. After the Civil War ended, the Parrott brothers Eugene and Edwin both returned to the linseed oil business. In 1869, the brothers incorporated the Malleable Iron Company, a foundry which had been established a few years earlier by others. 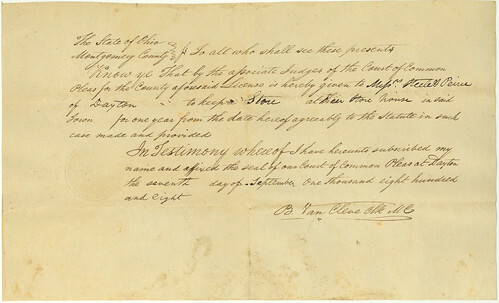 Eugene served as secretary and treasurer of the company; his older brother Edwin as president. In 1882, new officers took over the company, and Eugene became involved in marble dust manufacturing. 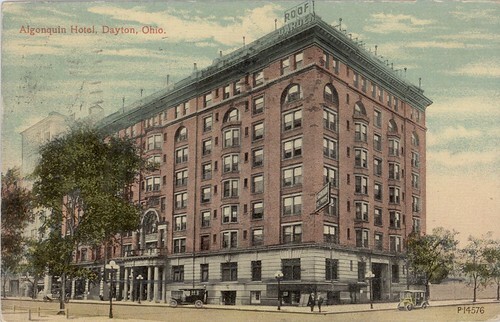 In later years, he held positions at the Dayton Board of Trade, the Dayton Automatic Gas Savings Company, and the National Cash Register Company. Despite his various forays into the Dayton business world, Eugene’s first love was farming. He owned a large farm in present-day Oakwood known as Briar Hill, with a herd of dairy cattle, as well as horses. In the winter of 1879, Eugene and Henrietta moved their growing family into a new stone and frame house that had been designed by an architect from Springfield, Massachusetts. Demonstrating their artistic abilities, Henrietta and her aunt and sisters personally did some of the decorative carving and painting inside the house. Eugene Parrott was one of the original signers of the petition to create the village of Oakwood, which was incorporated in 1908, and served as the village’s second mayor from 1910-1913. During the 1913 Flood, Henrietta invited refugees to stay at Briar Hill. The house was eventually sold in 1918. Henrietta’s will divided up the Briar Hill property among the family, resulting in the private road, Briar Hill Road, which still exists, although the Parrotts’ 1879 home burned down in 1969. 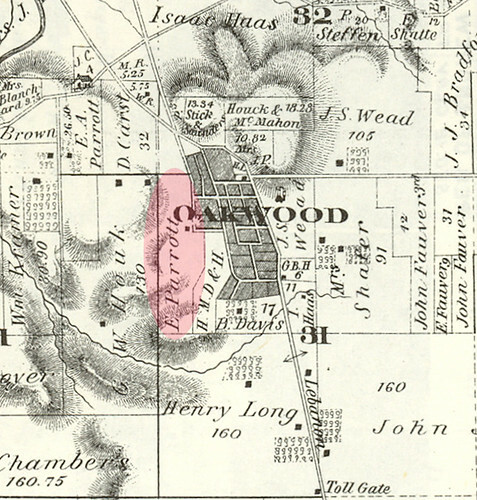 Further evidence of the family’s stamp on Oakwood is Forrer Boulevard, named for Henrietta’s grandfather Samuel Forrer; it formerly included what is now Oakwood Avenue and extended all the way from Far Hills to Park Avenue. Another example is Elizabeth Gardens Park, which was named for Henrietta’s mother Elizabeth (Forrer) Peirce. In addition to farming and business activities, Eugene taught Sunday school at Grace Methodist Episcopal Church for many years. He was a member of the “Saturday Club,” a men’s literary club in Dayton that met to hear papers and hold discussions, and he was also a Scottish Rite Freemason. And even in his old age, he never abandoned his love for horses and the outdoors, engaging in daily two-hour rides even after he reached 90. Henrietta E. (Peirce) Parrott died April 21, 1919, at the home of her daughter Mary Edward (Parrott) Clunet, Briar Hill, Oakwood, Ohio, after several months of illness; she was 70 years old. She was buried on April 23, 1919, in Woodland Cemetery in Dayton, Ohio. Henry Eugene Parrott died December 31, 1933, at Five Oaks in Dayton, Ohio (which was by then the home of his daughter Frances I. Parrott); he was 94 years old. He was buried on January 2, 1934, in Woodland Cemetery in Dayton, Ohio. 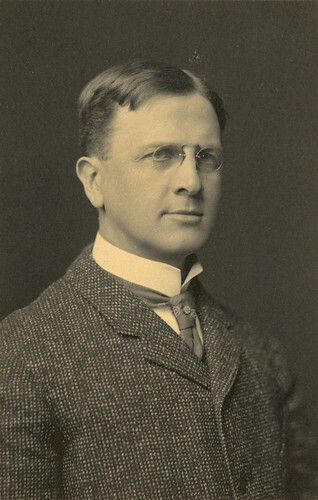 Edward Peirce Parrott was born November 16, 1872, in Dayton, Ohio. He was named for Henrietta’s brother Edward Davies Peirce, who had died a few years earlier. He died March 1, 1873. John Ennals Parrott was born January 25, 1874, in Dayton, Ohio. He was named for his father’s cousin John Parrott and for his father’s great-grandmother whose maiden name was Ennals. John was a lumber broker in Dayton. On June 21, 1905, in Dayton, he married Sophie Adéle Reynolds (1882-1944). They had one child: John E. Parrott, Jr. (1906-1966). John E. Parrott, Sr., died June 26, 1929, in Dayton, Ohio. Samuel Forrer Parrott was born April 5, 1875, in Dayton, Ohio. He was named after his great-grandfather Samuel Forrer, who died the previous year. He died August 21, 1875. Elizabeth Forrer Parrott, usually called “Beth,” was born May 27, 1876, in Dayton, Ohio. She was named for her grandmother Elizabeth (Forrer) Peirce, who died a few years earlier. On October 10, 1901, at Briar Hill, Beth married Samuel Ellis (1866-1929). They had six children. Elizabeth F. (Parrott) Ellis died in November 1979, probably in Buffalo, New York, where she had resided for many years. Frances Isabel Parrott was born January 21, 1878, in Dayton, Ohio. She was named after her father’s older sister Frances, who suggested Isabel as the middle name. She never married and lived with her father until his death. For several years, she was a reporter for the Dayton Daily News and an active member of the Montgomery County Historical Society. She died on July 13, 1934, at St. Elizabeth Hospital in Dayton, as a result of injuries sustained in an automobile accident the previous day. Marianna Parrott was born June 15, 1879, in Dayton, Ohio. She died October 29, 1879. 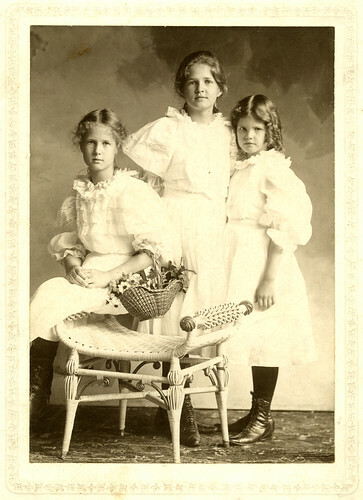 Mary Edward Parrott was born October 28, 1880, in Dayton, Ohio. She was named after her mother’s aunt Mary (Peirce) Davies, who was often called “Mary Edward” (Mrs. Edward Davies) to distinguish her from Mary (Loury) Davies (Mrs. Samuel Hiley Davies). 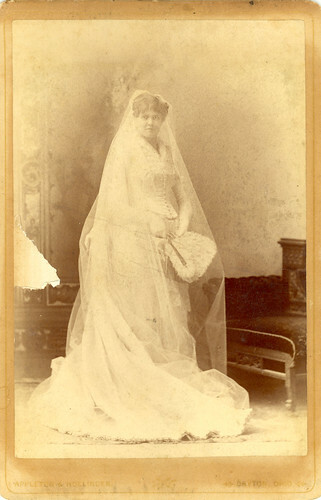 On February 27, 1902, in Montgomery County, Ohio, Mary Edward Parrott married Nathaniel Shannon Clunet (1866-1965), a contractor and consulting engineer from Baltimore. They had four children: Henrietta Parrott Clunet (1902-1998), who married Robert A. Ferguson Light (1897-1992); Mary Edward Clunet (1907-2001), who married Edmund Rossiter Sawtelle (1905-1964); Aimee Lannay Clunet (1909-1995), who married L. Keith Wilson; and Natalie Shannon Clunet (1911-1986), who married Roy Gerald Fitzgerald, Jr. (1910-1990), and later Charles J. Thornquest (1910-1986). Mary E. (Parrott) Clunet died June 15, 1945, at her home, Briar Hill, Oakwood, Ohio. Roger Sheffield Parrott (1883-1950). He was named Roger because his parents liked the name and Sheffield after his mother’s great-grandmother whose maiden name was Sheffield. Roger graduated from West Point in 1908 and attended the officers’ school of artillery at Fort Leavenworth, Kansas. He was a career soldier and served on the staff of General John Pershing during WWI. In 1924, he was awarded a Distinguished Service Cross for extraordinary heroism in the Philippines in 1909. In his later years, he was in charge of student military instruction at Princeton University. He was a U.S. Army colonel when he retired. On February 11, 1909, in Dayton, Ohio, Roger married Mary Barlow Ohmer (1883-1950), daughter of Edward G. and Clara (Legler) Ohmer, of Dayton. They had two children: Virginia Sheffield Parrott (1912-1986), who married T. Hughlett Henry, Jr., and Thomas Alexander Parrott (1914-2007). Roger S. Parrott died November 11, 1950, in Washington, DC. 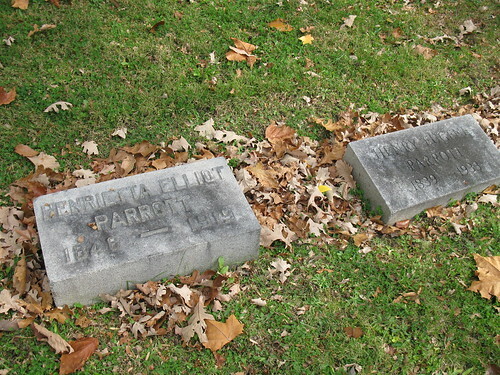 The last child of Eugene and Henrietta Parrott was a son born on June 2, 1887. He died the same day and so was never named. Frank Bruen, Christian Forrer, the Clockmaker, and his Descendants (Rutland, VT: Tuttle, 1939), 106; Frances I. Parrott, Henrietta Elliot Peirce (Dayton, OH: s.n., 1919? ), n.p. 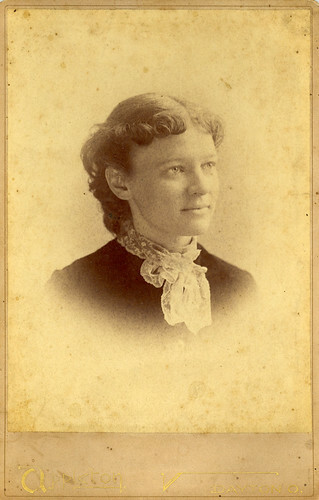 Parrott, Henrietta Elliot Peirce, n.p. ; Bruen, Christian Forrer, 107; Mary Sayre Haverstock, Jeannette Mahoney Vance, & Brian L. Meggitt, eds., Artists in Ohio, 1787-1900: A Biographical Dictionary (Kent, OH: Kent State University Press, 2000), 670. Parrott, Henrietta Elliot Peirce, n.p. ; Bruen, Christian Forrer, 106. Bruen, Christian Forrer, 106-112; Forrer Genealogical Data, Forrer-Peirce-Wood Collection (hereafter cited as FPW), 7:12, Dayton Metro Library (Dayton, Ohio). H. Eugene Parrott’s diary, 26 May 1862, FPW, 31:1. H. Eugene Parrott’s diary, 11-22 June 1862, FPW, 31:1. H. Eugene Parrott’s diary, 2-13 Sept. 1862, FPW, 31:1; Bruen, Christian Forrer, 110. Bruen, Christian Forrer, 110; American Civil War Soldiers (database), Ancestry Library Edition. Harvey W. Crew, History of Dayton, Ohio (Dayton, OH: United Brethren Publishing House, 1889), 430-431; Dayton City Directories. 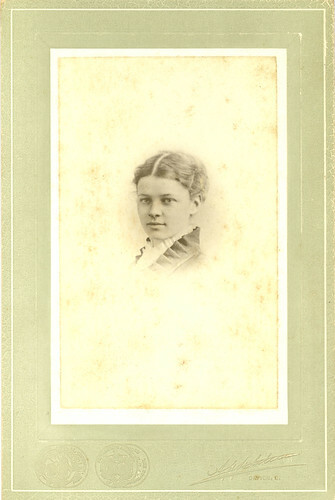 Parrott, Henrietta Elliot Peirce, n.p. Harry G. Ebeling, “Parrott Family Key to North Oakwood Development,” Oakwood Register, 17, no. 22 (27 May 2008), accessed 27 Feb. 2012, http://www.oakwoodregister.com/archives/2008/v17num22_052708/people.html. Parrott, Henrietta Elliot Peirce, n.p. ; Ebeling, “Parrott Family Key to North Oakwood Development.”Bruen, Christian Forrer, 107-108. 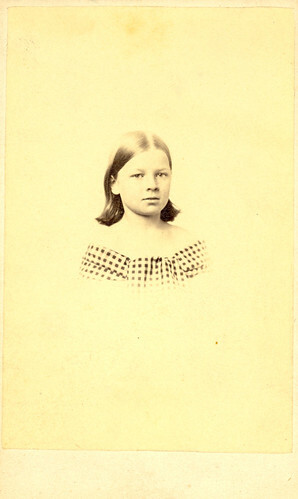 Parrott, Henrietta Elliot Peirce, n.p. ; Ebeling, “Parrott Family Key to North Oakwood Development”; Bruen, Christian Forrer, 107-108. H. Eugene Parrott’s diary, [several entries], FPW, 31:1; The History of Montgomery County, Ohio (Chicago: W. H. Beers & Co., 1882), 650-651. Bruen, Christian Forrer, 111; Henry Eugene PARROTT: Ancient Accepted Scottish Rite of Freemasonry Membership Cards and Certificates, FPW, 31:5. Bruen, Christian Forrer, 106-108; Woodland Cemetery & Arboretum Interment Database, accessed 21 Feb. 2012, http://www.woodlandcemetery.org. Henrietta is buried in Section 103, Lot 1793. Bruen, Christian Forrer, 106, 108-112; Woodland Cemetery & Arboretum Interment Database, accessed 21 Feb. 2012, http://www.woodlandcemetery.org. Eugene is buried in Section 103, Lot 1793. Bruen, Christian Forrer, 112-113; Parrott, Henrietta Elliot Peirce, n.p. ; Woodland Cemetery & Arboretum Interment Database, accessed 21 Feb. 2012, http://www.woodlandcemetery.org; Ohio Births & Christenings Index, 1800-1962 (database), Ancestry Library Edition; California Death Index, 1940-1997 (database), Ancestry Library Edition. Bruen, Christian Forrer, 113; Parrott, Henrietta Elliot Peirce, n.p. ; Woodland Cemetery & Arboretum Interment Database, accessed 21 Feb. 2012, http://www.woodlandcemetery.org. Bruen, Christian Forrer, 113-114; Parrott, Henrietta Elliot Peirce, n.p. 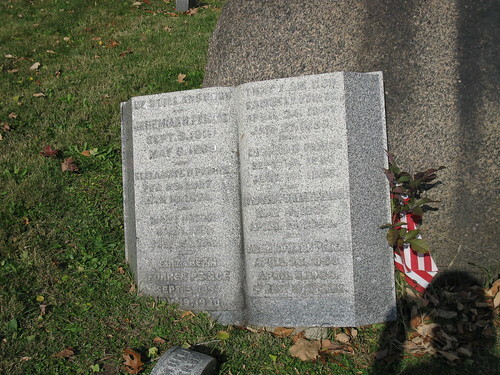 ; Social Security Death Index (database), Ancestry Library Edition; Find A Grave, accessed 21 Feb. 2012, http://www.findagrave.com/cgi-bin/fg.cgi?page=gr&GRid=70644723. Bruen, Christian Forrer, 114-115; Parrott, Henrietta Elliot Peirce, n.p. ; Woodland Cemetery & Arboretum Interment Database, accessed 21 Feb. 2012, http://www.woodlandcemetery.org; Ohio Deaths, 1908-1953 (database), FamilySearch, accessed 22 Feb. 2012, http://www.familysearch.org. Bruen, Christian Forrer, 115; Parrott, Henrietta Elliot Peirce, n.p. ; Woodland Cemetery & Arboretum Interment Database, accessed 21 Feb. 2012, http://www.woodlandcemetery.org; Ohio, County Births, 1856-1909 (database), FamilySearch, accessed 22 Feb. 2012, http://www.familysearch.org. Bruen, Christian Forrer, 116; Parrott, Henrietta Elliot Peirce, n.p. ; Ohio Deaths, 1908-1953 (database), FamilySearch, accessed 22 Feb. 2012, http://www.familysearch.org; “Services Monday for Mrs. Clunet” (obituary), Dayton Journal, 16 Jun 1945; Woodland Cemetery & Arboretum Interment Database, accessed 21 Feb. 2012, http://www.woodlandcemetery.org; Social Security Death Index (database), Ancestry Library Edition; Georgia Death Index, 1933-1998 (database), FamilySearch, accessed 22 Feb. 2012, http://www.familysearch.org. Bruen, Christian Forrer, 111, 116-122; Parrott, Henrietta Elliot Peirce, n.p. ; “Roger Sheffield Parrott” in Hall of Valor, Military Times, accessed 28 Feb. 2012, http://militarytimes.com/citations-medals-awards/recipient.php?recipientid=16155; Princeton University Archives, Faculty database, accessed 28 Feb. 2012, http://www.princeton.edu/~mudd/databases/faculty.html; Fauquier (VA) Democrat/Times-Democrat Newspaper Index (database), Fauquier County Public Library, accessed 28 Feb. 2012, http://www.fauquiercounty.gov/government/departments/library/index.cfm?action=FDIIndex; U.S. Passport Applications, 1795-1925 (database), Ancestry Library Edition; Gravestone of Virginia S. (Parrott) Henry, Maryland Gravestones, accessed 28 Feb. 2012, http://marylandgravestones.org/view.php?id=2403; “Thomas Alexander Parrott,” Wikipedia, accessed 21 Feb. 2012, http://en.wikipedia.org/wiki/Thomas_Alexander_Parrott. 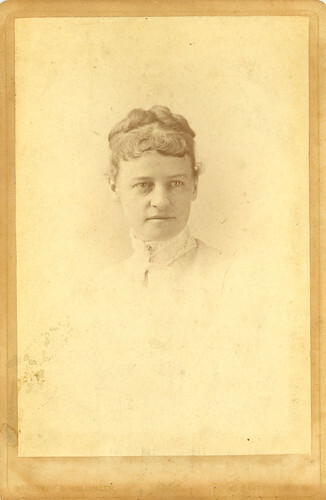 Parrott, Henrietta Elliot Peirce, n.p. ; Woodland Cemetery & Arboretum Interment Database, accessed 21 Feb. 2012, http://www.woodlandcemetery.org. 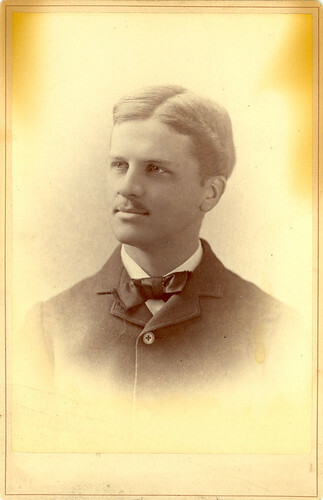 John Elliot Peirce, Sr., usually known as J. Elliot (or simply “Elliot” to family), was born April 17, 1861, in Dayton, Ohio, the son of Jeremiah H. Peirce (1818-1889) and Elizabeth H. Forrer (1827-1874). Elliot was apparently named after his great-grandfather, Dr. John Elliot. Elliot received his education at Cooper Academy and continued his studies until he was about 20 years old. About 1881, Elliot began working as a clerk at Peirce & Coleman, the lumber business in which Elliot’s father J. H. Peirce was senior partner. 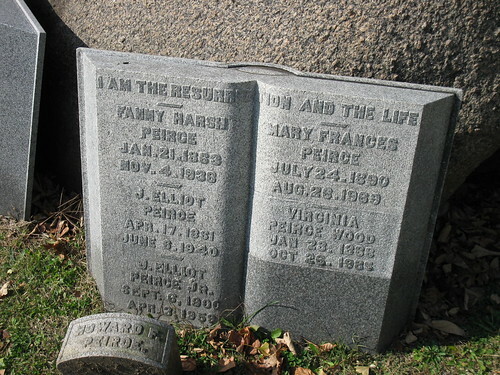 On September 10, 1885, J. Elliot Peirce married Mary Frances “Fanny” Harsh, daughter of Mr. and Mrs. J. V. Harsh of Findlay, at the Methodist Episcopal Church in Findlay, Ohio. After Elliot’s father J. H. Peirce died in 1889, Elliot soon became president and treasurer of the Peirce & Coleman Company, which he incorporated in 1891. Under Elliot’s presidency, Peirce & Coleman did business in general contracting and building, especially in dealing hardwood lumber. Elliot remained president of Peirce & Coleman until 1896, when the company was dissolved. Beginning about 1891, Elliot was secretary and treasurer of the Superior Stone Company, which produced cement sidewalks and marblelithic work. This company ceased to exist about 1895. After the Peirce & Coleman Company dissolved in 1896, Elliot turned his attention more fully to the Dayton Marblelithic Company, of which he was then vice president. By 1900 he was manager of the company and would continue to be associated with it until his death. The Dayton Marblelithic Company (later simply “Marblelithic Company”) initially dealt in marblelithic, clay tiles, mosaics, and marble; it later dealt also in ceramic, rubber, asphalt and cork tile, structural glass, and linoleum. In the late 1890s, Elliot embarked on another type of business venture, when he hired Dayton architect Charles Insco Williams to design and build the Algonquin Hotel (now the Doubletree Hotel), which opened at the southwest corner of Third and Ludlow Streets in 1898. The Peirce-Williams Company, of which Elliot was president and general manager, were proprietors of the hotel until about 1917. For many years, the J. Elliot Peirce family lived near Elliot’s childhood home, Five Oaks. Elliot’s home, like Five Oaks, was described as being on the west side of Forest Avenue, except Elliot’s was north of Rung Road, rather than just opposite it. In the early 1900s, Elliot’s house was described as being at the southwest corner of Broadway and Old Orchard, later southwest corner of Homewood and Old Orchard. For many years while Elliot operated the Algonquin Hotel, the family lived at the hotel but kept their home in the Five Oaks neighborhood as a summer house. In 1918, Elliot’s house was identified as 551 N. Old Orchard. In 1922, the family residence was 1037 N. Old Orchard, a house that still exists at the southwest corner of Homewood and Old Orchard. About 1930, Elliot and Fanny moved to 339 Kramer Road in Oakwood, where they lived until death. 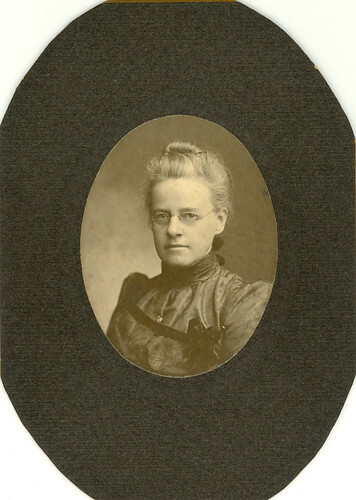 Fanny H. Peirce died on November 4, 1936, at her home, 339 Kramer Road, Oakwood, Ohio; she was 73 years old. She was buried on November 6, 1936, in Woodland Cemetery in Dayton, Ohio. J. Elliot Peirce died on June 6, 1940, at his home, 339 Kramer Road, Oakwood, Ohio; he was 79 years old. He was buried on June 8, 1940, in Woodland Cemetery in Dayton, Ohio. Elizabeth Forrer Peirce, usually called Bess, was born August 7, 1886, in Dayton, Ohio. On June 29, 1911, at Five Oaks, she married Joseph Bradford Coolidge (1886-1965), a lawyer from Medford, Massachusetts. They had two children: Mary Elizabeth Coolidge (1912-2008), who married Robert Schantz Oelman (1909-2007); and Dorothy Peirce Coolidge (1916-2000), who first married Robert R. Woodward (1909-1955) then married John D. Runyan (1912-1994). Elizabeth F. (Peirce) Coolidge died May 5, 1973, in Dayton, Ohio. Virginia O’Neil Peirce was born January 28, 1888, in Dayton, Ohio. She graduated from Smith College in 1910. On June 29, 1910, at Five Oaks, Virginia married General George Henry Wood (1867-1945), son of Major General Thomas J. Wood (1823-1906) and Caroline (Greer) Wood, of Dayton. 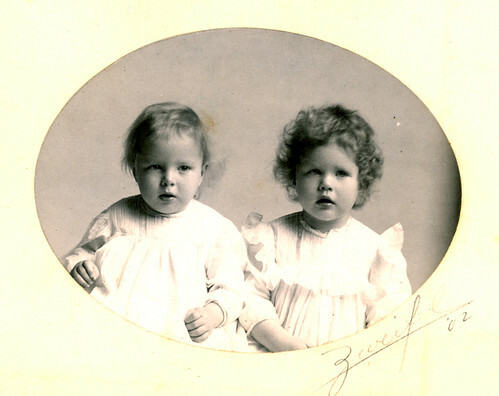 They had two children: Thomas John Wood, III (1911-1996), and Peirce James Wood (1914-1987). Virginia O. (Peirce) Wood died October 26, 1985, in Brevard County, Florida. Mary Frances Peirce was born July 24, 1890, in Dayton, Ohio. She graduated from Smith College in 1912. She worked at the Marblelithic Company with her father and brother. She never married. Mary F. Peirce died on August 26, 1969, in Brevard County, Florida. Dorothy Howard Peirce was born September 6, 1900, in Dayton, Ohio. On June 14, 1924, at Five Oaks, she married Robert Alexander Johnston Morrison (1898-1976), a trainmaster from Cincinnati. They had several children. Dorothy H. (Peirce) Morrison died June 3, 1986, in Cincinnati, Ohio. John Elliot Peirce, Jr., usually called Jack, was born September 6, 1900, in Dayton, Ohio. He worked at the Marblelithic Company with his father. He was unmarried. John E. Peirce, Jr., died in April 1959 in Brevard County, Florida. Frank Bruen, Christian Forrer, the Clockmaker, and his Descendants (Rutland, VT: Tuttle, 1939), 126; Frank Conover, Centennial Portrait and Biographical Record of the City of Dayton and Montgomery County, Ohio (Chicago: A. W. Bowen, 1897), 305; Augustus W. Drury, History of the City of Dayton and Montgomery County, Ohio, (Chicago: Clarke Publishing Co., 1909), vol. 2, 663. 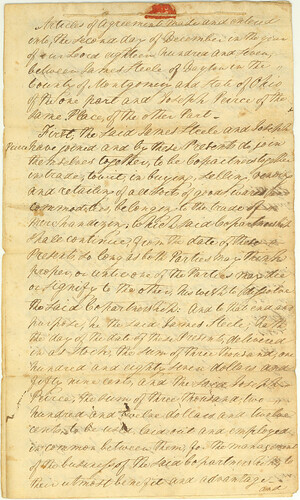 Conover, Centennial Portrait, 305; John Elliot Peirce, Sr.: Report cards from Cooper Academy, Forrer-Peirce-Wood Collection (hereafter cited as FPW), 28:7, Dayton Metro Library (Dayton, Ohio); Drury, History of the City of Dayton, vol. 2, 664.
. Bruen, Christian Forrer, 124-125; John Elliot Peirce, Sr.: Newspaper Clippings, FPW, 28:8. Drury, History of the City of Dayton, vol. 2, 664; Conover, Centennial Portrait, 305; Dayton City Directories. Drury, History of the City of Dayton, vol. 2, 664; Dayton City Directories. Curt Dalton, Dayton (Charleston, SC: Arcadia, 2006), 62; Dayton City Directories. Dayton City Directories; Sanborn Fire Insurance Maps. Bruen, Christian Forrer, 124; Woodland Cemetery & Arboretum Interment Database, accessed 20 Dec. 2011, http://www.woodlandcemetery.org. Fanny is buried in Section 77, Lot 20. “J. E. Peirce Funeral Set” (obituary), Dayton Journal, 7 June 1940; Woodland Cemetery & Arboretum Interment Database, accessed 26 Oct. 2011, http://www.woodlandcemetery.org. Elliot is buried in Section 77, Lot 27. Bruen, Christian Forrer, 125; Social Security Death Index (database), Ancestry Library Edition; Woodland Cemetery & Arboretum Interment Database, accessed 15 Feb. 2012, http://www.woodlandcemetery.org; Obituary of Robert S. Oelman, 16 May 2007, New York Times; Obituary of Mary Elizabeth (Coolidge) Oelman, [July 2008], Scobee-Combs-Bowden Funeral Home web site, accessed 17 Feb. 2012, http://www.funeralplan2.com/scobeecombsbowdenfuneralhome/archive?id=140657; Obituary of Dorothy (Coolidge) Runyan, Dayton Daily News, 27 Jan. 2000. Bruen, Christian Forrer, 125; Social Security Death Index (database), Ancestry Library Edition; Florida Death Index, 1877-1998 (database), Ancestry Library Edition. Bruen, Christian Forrer, 125; Dayton City Directories; Social Security Death Index (database), Ancestry Library Edition; Florida Death Index, 1877-1998 (database), Ancestry Library Edition; Death notice of Mary Frances Peirce, Dayton Journal Herald, 7 Oct. 1969; Dayton City Directories. Bruen, Christian Forrer, 126; Ohio, County Births, 1856-1909 (database), FamilySearch, accessed 17 Feb. 2012, http://www.familysearch.org; Dorothy Howard (Peirce) Morrison: Newspaper Clippings, FPW, 30:3; Spring Grove Cemetery Interment Database, accessed 17 Feb. 2012, http://www.springgrove.org; U.S. Passport Applications, 1795-1925 (database), Ancestry Library Edition. Bruen, Christian Forrer, 126; Dayton City Directories; County Births, 1856-1909 (database), FamilySearch, accessed 17 Feb. 2012, http://www.familysearch.org; Florida Death Index, 1877-1998 (database), Ancestry Library Edition; Dayton City Directories. Elizabeth Forrer Peirce, often called “Bess,” was born September 5, 1857, in Dayton, Ohio, the daughter of Jeremiah H. Peirce (1818-1889) and Elizabeth H. Forrer (1827-1874). Elizabeth was probably named after her mother, whose maiden name was Elizabeth Forrer, or possibly her great-grandmother Elizabeth (Neidig) Forrer, who had died a few years earlier. As a young woman, Elizabeth studied at Cooper Female Seminary in Dayton. Elizabeth lived at Five Oaks nearly all of her life. Even in her old age, Elizabeth lived there with her Aunt Mary (Forrer) Peirce and her sister Sarah Howard Peirce. However, on two separate occasions during her thirties, Elizabeth made extended stays in Boston, Massachusetts. The first of these times began in November 1890, when Elizabeth went to stay with her brother Howard F. Peirce, who was studying and performing in Boston. They lived at 198 Tremont Street. While there, Elizabeth attended many lectures (several on literature) and visited friends, including the Diman family. It was decided that Elizabeth would stay in Boston. She remained there until the end of April 1891, after which time she returned to Five Oaks. Elizabeth argued that while her aunt might find teaching a more suitable profession, she did not think she would make a good teacher. She also expressed a desire to earn her own money. Bess has written me telling what she is wanting to do. Of course, I would not presume to oppose her, but I am very sorry she has chosen a profession that we think will undoubtedly result in invalidism. I hoped, after the years of sadness and sorrow through which we have passed, that when you were once more restored to health and all home together [to] live happily in our lovely home, as your father had so carefully and kindly arranged.—If the poor child would only turn her attention to literary pursuits and not try to break down the little strength she has, it does seem to me, the result might be more satisfactory. I have been feeling very sad since receiving her letter. Elizabeth executed her plan to train as a nurse in August 1893, returning to Boston again to train as a nurse in the Massachusetts general hospital there. She remained in Boston until October 1894, although her school work had ended in June. After Elizabeth returned to Five Oaks at the end of 1894, she began working as a nurse in Dayton. She is listed as a nurse in the city directories from 1895 through the 1901-1902 edition. From 1902 until her death, she has no occupation listed. It is not clear why her nursing career ended. Although her formal career had ended, Elizabeth still kept busy with many activities outside the home. 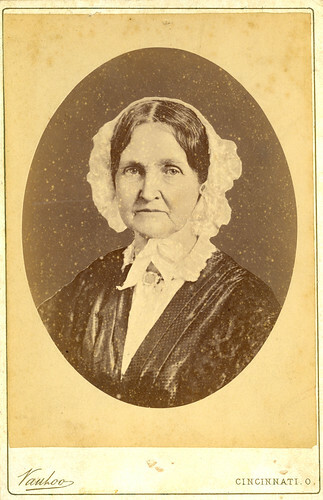 Elizabeth was one of the founding members of the First Unitarian Church of Dayton, along with her sister Sarah Peirce and her Aunt Mary Peirce. She was also active in the Woman’s Literary Club, of which she was a founder and past president, as well as the Needlework Guild of America. Elizabeth F. Peirce died on November 19, 1930, at her home at 120 Volusia Avenue in Dayton, Ohio; she was 73 years old. She was buried on November 21, 1930, in Woodland Cemetery in Dayton, Ohio. Frank Bruen, Christian Forrer, the Clockmaker, and his Descendants (Rutland, VT: Tuttle, 1939), 123. “Funeral for Miss Peirce to be Friday,” Dayton Daily News, 20 Nov. 1930, in Elizabeth Forrer Peirce: Obituaries, Forrer-Peirce-Wood Collection (hereafter cited as FPW), 23:9, Dayton Metro Library (Dayton, Ohio). Various letters from Elizabeth F. Peirce to her family, FPW, 19:9, 19:13, 20:4. Elizabeth F. Peirce to her sister Sarah H. Peirce, 1-2 Dec. 1890, FPW, 19:9. Elizabeth F. Peirce to her aunt Mary Forrer Peirce, 11 Oct. 1892, FPW, 20:4. 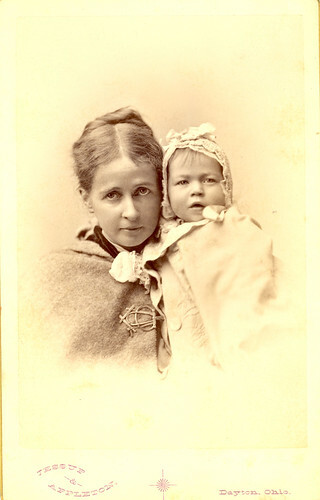 Mary Forrer Peirce to her niece Sarah H. Peirce, 15 Oct. 1892, FPW, 12:4. Various letters from Elizabeth F. Peirce to her family, FPW, 19:9, 20:2, 20:4; Frank Conover, Centennial Portrait and Biographical Record of the City of Dayton and Montgomery County, Ohio (Chicago: A. W. Bowen, 1897), 310. “Funeral for Miss Peirce to be Friday,” Dayton Daily News, 20 Nov. 1930, in FPW, 23:9. Woodland Cemetery & Arboretum Interment Database, accessed 2 Feb. 2012, http://www.woodlandcemetery.org. 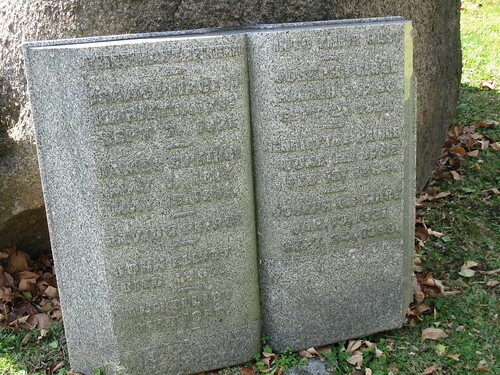 Elizabeth is buried in Section 77, Lot 24. 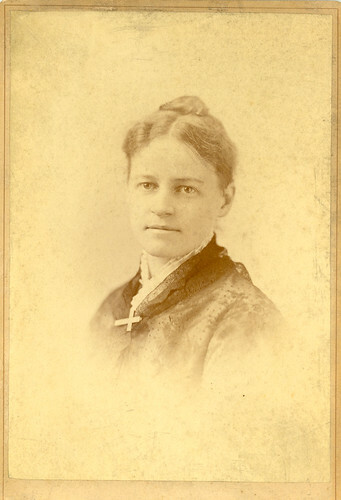 Mary Forrer Peirce, usually called “Mellie,” was born January 1, 1855, in Dayton, Ohio, the daughter of Jeremiah H. Peirce (1818-1889) and Elizabeth H. Forrer (1827-1874). Mellie was apparently named after her aunt, who was then simply Mary Forrer, and who later also became Mary Forrer Peirce, after marrying Mellie’s father Jeremiah H. Peirce. In the early part of 1872, from January to about June, Mellie lived in Sandusky, Ohio, with George and Nancy (Follett) Thornton, and attended school there. While in Sandusky, she suffered a serious illness, possibly the mumps, in February. Mellie stayed with the Thorntons again in the spring of 1880, at which time they lived in the Clifton neighborhood of Cincinnati. From June 1874 to August 1875, Mellie toured Europe with her Aunt Mary Forrer. Mrs. Thornton and her daughter Mary, as well as several other acquaintances were also present for parts of the trip. Mellie seems to have primarily entertained herself with sight-seeing, although she did study German and music (piano, it seems) while visiting Germany. Mellie hoped that her brother Howard (then 9 years old and already quite talented at piano apparently) would have the opportunity to study music in Germany, since it would (in her opinion) benefit him so much more than her. Like many members of the Forrer and Peirce families, Mellie was interested in art and music. She played piano. She also painted; she mentioned painting flowers and painting on china. It is not clear whether Mellie ever had any particular occupation. Mellie seems to have been afflicted for most of her life with poor health. She apparently suffered from severe headaches, backaches, fatigue, neuralgia, and general feebleness. November 1874: Mellie mentioned that her back had now been “broken in” and had not given her any trouble for a few days. November 1887: Mellie wrote: “Last night I slept in my own room for the first time, not having walked upstairs before, since the accident… Am strong enough now to walk without help and shall soon be well as ever…” The nature of her accident is unclear. Mellie was ill again in June through July 1892. Her symptoms included a persistent cough, as well as rheumatism and a swollen leg. Mellie Peirce died on July 25, 1892, at her home at Five Oaks in Dayton, Ohio; she was 37 years old. She was buried on July 27, 1892, in Woodland Cemetery in Dayton, Ohio. 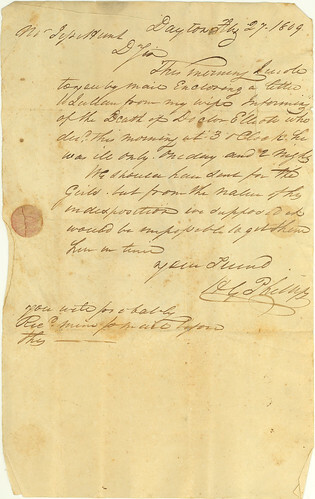 Various letters to, from, and about Mellie Peirce, FPW, 18:13, 18:16, 18:18, 9:11. Mellie Peirce to her family (several letters), FPW, 18:22 & 18:23. Mellie Peirce to her sister Henrietta Parrott, 1 Nov. 1874, FPW, 18:22; Mellie Peirce to her family, 25 Feb. 1875, FPW, 18:23. Mellie Peirce to her family (several letters), FPW, 18:14, 18:16, 18:20, 18:22, 18:23. Mellie Peirce to Sarah H. Peirce, 24 Apr. 1868, FPW, 18:16. Nancy F. Thornton to J. H. Peirce, 11 Feb. , FPW, 9:12. Nancy F. Thornton to J. H. Peirce, 20 Feb. , FPW, 9:12. Mellie Peirce to her sister Henrietta Parrott, 1 Nov. 1874, FPW, 18:22. Nancy F. Thornton to J. H. Peirce, 8 May 1878, FPW, 9:12. George Thornton to J. H. Peirce, 23 Apr. 1880, FPW, 9:11. Mellie Peirce to her father J. H. Peirce, 3 Dec. 1882, FPW, 18:13. Mellie Peirce to her brother Howard F. Peirce, 20 July 1884, FPW, 18:20. Mellie Peirce to her brother Howard F. Peirce, 16 Nov. 1887, FPW, 18:20. Sarah H. Peirce to her brother Howard F. Peirce, 24 Apr. 1891, FPW, 18:21. Sarah H. Peirce to her sister Elizabeth F. Peirce (several letters), June-July 1892, FPW, 14:3. Death notice of Mary Peirce, Dayton Journal, 27 July 1892; Woodland Cemetery & Arboretum Interment Database, accessed 23 Jan. 2012, http://www.woodlandcemetery.org; Bruen, Christian Forrer, 123. Bruen incorrectly states that Mary died on July 23, rather than July 25. Woodland Cemetery & Arboretum Interment Database, accessed 23 Jan. 2012, http://www.woodlandcemetery.org. Mellie is buried in Section 77, Lot 18.